That’s not to say that I’m endorsing a laisse fair attitude about parenting, but a lot of us tend to worry and over think things. Then, we finally go to do the big worrisome thing, and it’s nothing like we imagined. Now, there are a lot of things in life that you can’t just jump straight into. You need to train and prepare to get optimal results. I’ve heard it said that parenting is a marathon, not a sprint. This is an amazing analogy that I’m sure lots of people have thoroughly analyzed. But if you spend too much time thinking about how incredibly important and life-shaping it is to do a devotional with your kids, you’ll get some pretty serious paralysis of analysis before you’ve ever chosen a book. 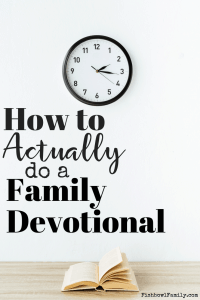 So go read our post about the best devotional for your whole family, and come back to this for our tips on exactly how to do a family devotional. This post, How to Do a Family Devotional, contains affiliate links for your convenience. This means that if you make a purchase using our link we will receive compensation at no additional cost to you. Read our full disclosure policy. In high school, we had to read The Seven Habits of Highly Effective People. I can’t remember a single one of the seven habits now, but I do remember thinking I was going to be a very ineffective person. And there are many days that end with the only thing we accomplished was the daily devotional. It’s easy to get caught up in your kid’s test grades, sports performances, social life, or whatever. But at the end of the day, our primary job is to raise kids who love Jesus. And thus far, I’m pretty sure I’m getting that part right. They may fight with each other like cats and dogs, use a sassy tone and roll their eyes at me, and consistently use markers on every surface in our home, but they love going to church, listening to worship music, serving others, and doing our devotional every day. And I love talking with them about the Bible. And that’s not because I know all the answers. I often refer them to their dad or Google because I don’t know. So I’m right there learning along with them. And that’s what I love about it. They love learning about Jesus. Those seeds are being planted in their hearts, and they will remember these lessons and stories for their whole lives. Give them good things to absorb. When deciding when to do your family devotional, try to choose a time of day when everyone is relatively calm. With four kids, ages 3-10, that rarely happens, so if you struggle to think of a time your kids are EVER calm, don’t worry. For us, mid-morning works best. I wait until the kids have all eaten breakfast and started on their school work for the day (yes, we’re a crazy homeschooling family, even though I hate it). Since they’ve already settled down and are doing school work, my interruption is very welcome. But I don’t let them get all crazy to assemble. There’s no yelling or jumping or cheering or hopping. They’re all supposed to come to the dining room table calmly and take a seat. Part of this is because I’m not a fun mom, and I just don’t like silliness in general. But most of it is that we are about to open God’s Holy Word together and I want them to be calm enough to be somewhat reverent. I want them to be able to focus on what we’re talking about and what the Bible says. It’s hard to do that when you’re all hyped up from doing frog hops to the table. And teaching reverence to a three-year-old is hard no matter what, but it’s much easier when he sees his older siblings sitting and acting right. And a tiny part of the reason for the calm atmosphere during the devotional time is that the other times in their lives that the Bible is read is very calm. There is no jumping, running, or playing during worship on Sunday mornings. And since it is already so tough to train kids to sit still during big church, this small step at home can really help with that endeavor. I read My Utmost for His Highest a few years ago, and it was SO GOOD. It was deep, and I had to really think about things and dig into my Bible for answers. But that isn’t a good devotional to do with your kids. For your kids, you need it to be short and to the point. I’m not saying to rush through the devotional, but try to get through the whole thing before taking any questions or chasing any rabbits. We are currently doing Long Story Short with our kids. And almost without fail, as soon as I start reading the devotional, someone’s hand shoots up. I usually just put up the one finger that means “hold on a second and I’ll call on you in a minute.” That’s a pro move from my teaching days. And often, the burning question that the kid had is answered while I’m reading the actual devotional to them. The author, Marty Machowski, is good like that. The time of our devotional where I am actually reading the devo or the Bible is about five minutes. However, we’ve had days where we sat and talked for thirty minutes because my kids had questions and ideas. But all of that great discussion comes after we finish the devotional. It’s hard to get back on track once you’ve derailed. This part is tough for me because I’m not a fun mom. But when you can, try to incorporate extra things besides just the Bible and the devotional. Depending on which devotional you choose, activities will be included. To help you choose a devotional, check out our post, The Best Devotional for Your Family. Whatever devotional you choose will probably have fantastic explanations and illustrations. Your kids will probably still ask 382 questions. Be prepared to explain it to them again. So make sure you are in a good head space and mindset. If your patience is already thin and you are running on empty, it might not be the best time to sit down and do a devotional. Remember this is a devotional for your kids. You still need to do your own devotional and feed your own soul. Spending time with Jesus first thing in the morning before my kids (or husband!!) get up is crucial to having a good a day. For some tips on which devotional to get for you, check out our post The Best Devotionals for Moms in the Trenches of Motherhood. If When your kids ask you questions you don’t know, it’s okay. Just have your phone and Bible handy and find the answer. It is okay for them to see you learning more about Jesus with them. Your kids don’t expect you to be a seminary scholar overnight. In conclusion, doing a family devotional may seem overwhelming. But with the right devotional and the right mindset, you’ll be teaching your kids (and yourself!) more about the Bible and Jesus in no time. 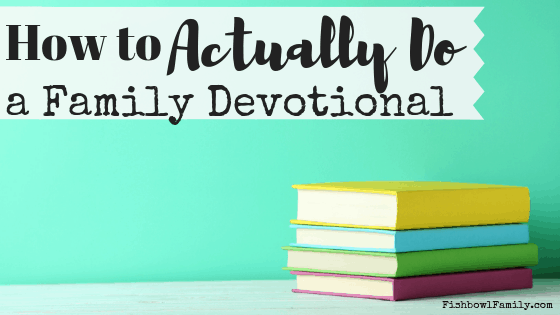 Have you ever struggled with how to do a family devotional? What helped you to figure it out? Tell us in the comments!